Sandy started her culinary career at 25 which is a little later than she had hoped. When she was 12 years old, her family sent her to Vancouver from Taiwan to live with her aunt. 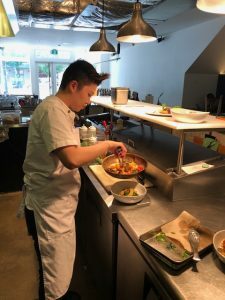 While growing up she developed an interest in cooking after watching Iron Chef shows, reading cookbooks and then cooking. 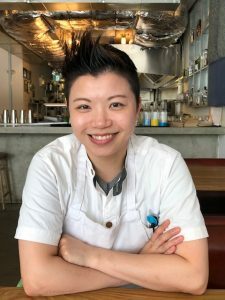 She comes from a traditional Chinese family who wanted her to go to university and become a doctor or a lawyer, she ended up listening to them and studied Psychology graduating with a degree from Kwantlen college. 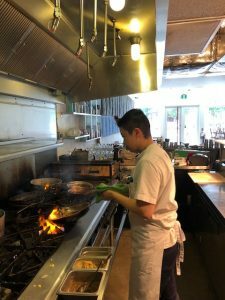 After graduation she then enrolled into VCC (Vancouver Community College) attending their culinary program for a year studying under Chef JC and Chef Tobias. Right after graduation in 2010 she got a job at the Fairmont Pacific Rim Hotel which just opened prior to the Olympics. She worked all over the hotel including Banquet, Room service, starting at the Sushi Bar with Chef Taka, he taught her a lot about flying fish, oysters, sea urchin, sushi rinse, sashimi, Japanese knives and more. 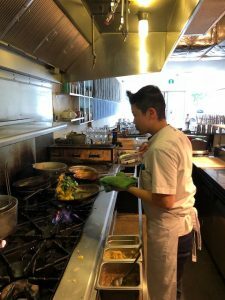 She spent 3 years working at the Fairmont Pacific Rim Hotel as cook #2. At the same time, she got a part time job at the Le Tigre Food Truck as the Fryer. 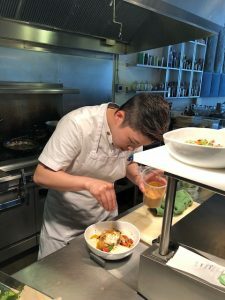 Sandy left the hotel and became full time on the Le Tigre truck; she then joined Torafuku in 2015 when the restaurant opened and has been there ever since as the Sous Chef. When was your first cooking competition? In my 1st year of VCC as part of Team Canada in Costa Rica, there were 3 of us on the team at this black box competition, it was an incredible opportunity and we won 1st place. I was pumped after this and wanted to compete more. I competed again and won 2nd place at the Vancouver Convention Centre’s JR Hot Cooking Competition while I was still in school. After school, during the 3rd year of working at the Fairmont Pacific Rim. Chef Clement Chan started coaching me, I trained for a month before the competition. Then competed in the Jr. BC Chef Assn and won 1st place Gold; I was a supporting member for Team Canada. I also competed in all the BC Chefs competitions, kept training to get higher marks. Clement taught me a lot during these competitions. In 2015 I won the iron chef competition. In 2016, at VCC, I won 1st place in the BC Chefs Black Box Challenge. I then represented BC at the National competition and won 1st place for Canada. 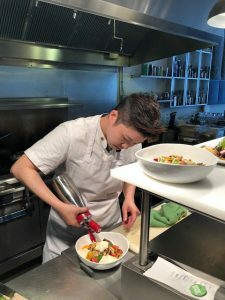 In 2017, an opportunity came up for me to go to the Parq Vancouver Hotel on a contract as a consulting Chef for The Victor. (I did a sushi demo for my interview for Chef Kim); then there was a twist, as The Victor project was postponed. 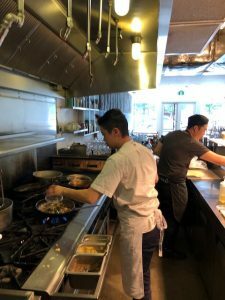 They needed help in the 1886 Restaurant kitchen and moved me there for 4 months helping their chefs team, I then moved back to The Victor as a Sous Chef right when they opened. 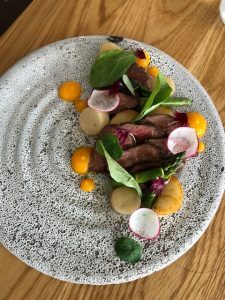 Finished my 6 month contract and then left, returning to Torafuku in 2018, and along with Chef Clement they then changed the menu focus in their restaurant. Was it public knowledge that you were working at the Parq Vancouver Hotel? Some people didn’t know I left Torafuku for Parq, but it was only for a 6 months break and I learned a lot there. What did you learn while working at Parq Vancouver? Would you take a consulting job like Parq Vancouver again? Not right now, it is a big time commitment and takes a lot of energy. 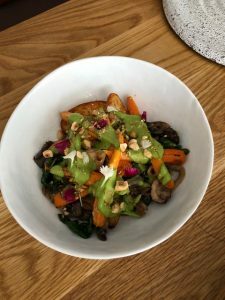 A vegetarian friendly dish, the concept of this sis we owe support to local farmers and the ingredients are from local farmers such as UBC Farm, Sole Food and Hannah Brook for the vegetables. 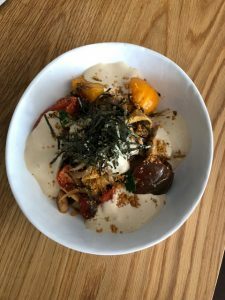 Espuma is made with gluten-free soy sauce and a hint of pochini powder, it adds more umami. A little bit of influence from the forest in Japan (earthy flavours). Vegetarian and vegan friendly. Local ingredients driven with carrots from Sole Food, Mushrooms from Oyster King, spinach from Hannah Brook. The restaurant is family friendly place we want the kids to enjoy the vegetables. Was it difficult for you living away from your parents while growing up? I self taught myself how to be independent. I lived with my aunt, all I did was study. Where was your first job after graduating high school? Local vegetable ingredients, the idea of the sauce came from the Phillipines, the dish is quite rich, with adobo sauce gives the acidity it make the dish perfect balance. We have a cold smoker with applewood chips, we place the tomatoes cut in half in the rack and have a bowl of ice at the bottom, let it smoke on medium heat for 1-1/2 hours.